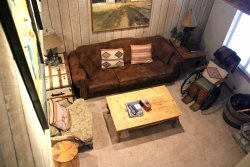 Two Bedroom & Loft & 2 Bath Condominium in town near the Sierra Star Golf Course and the shuttle route to the Eagle Lodge Express Ski Lift Area in Mammoth Lakes. Sleeps up to 8. Second Story unit with 2 levels. The Master Bedroom has 1 King Bed. The second bedroom has 1 Queen Bed and the Loft has 1 King Bed and 2 Twin Beds and a TV. There is one TV in the Living Room. No Sofa bed in the living room. Wifi Internet Access in the unit. There are 2 outside parking spaces available. There is a game room with a billiard table, a ping pong table and a video game in the lobby of the Sunshine Village condos. In the summer you have access to BBQ areas throughout the complex and a Tennis Court near the swimming pool at Sunshine Village. Coin-operated laundry facilities located in the common area near the office. COMPLIMENTARY INTERNET and CABLE TV are provided, however NO REFUNDS will be given for connectivity problems or Internet failure. TOT LICENSE 3390-SV150. This condo was perfect for our group of 7. Very spacious, clean, and cozy. An early check-in allowed was very helpful during the big storm, and I would easily stay here again with a group in the future. Lots of firewood, perfect hot tub, and great sauna. Customer service helpful as well! All in all, a good place to stay for the price. Good amount of beds. Good location. Lots of firewood. Great place, great price, centrally located. Thumbs-up overall! Location is excellent. Kitchen is great. Beds are a bit old and not the most comfortable specifically the sofa bed. Overall good value and check-in was very easy and smooth. Great place - clean and spacious. Would stay again.